Never Stress About World History Planning Again! Each unit in our World History curriculum includes detailed lesson plans with engaging projects, PowerPoints, guided notes, interactive notebook pages, digital Google resources, assessments, links to fun online review games & more! JOIN NOW Want FREE Resources? Click on any unit below to be taken to its page on TpT. There you can read reviews from other teachers and see previews of the resources. Joining here, however, gets you immediate access to ALL of these units immediately after signing up! A unit on the first humans, Paleolithic, & Neolithic Eras, and the characteristics that make up a civilization. Unit 2 covers the early civilizations in the Fertile Crescent and Ancient Egypt along the Nile River. A unit on the civilizations that developed along the Yellow River in Ancient China and the Indus River valley in India. A thorough overview of the geography, people, and cultures of Ancient Greece. A thorough overview of the development of Rome from the Republic to the Roman Empire and its fall. A brief unit on Constantinople after the split of the Roman Empire, Justinian, Theodora, and Byzantine culture. An overview of the founding of Islam and its growth through the Middle East and North Africa. A unit on the Shang, Zhou, and Qin Dynasties in China, India's Maurya and Gupta Empires, and the Silk Road. A look at feudalism, the Black Death, Crusades, and the Middle Ages in Europe. Resources on the Aztecs, Inca, and Maya in the Americans plus the African Empires of Ghana, Songhai, and Mali. A unit on the art, ideas, people, and culture of the Italian and Northern Renaissance of the 1500's. A look at Martin Luther, John Calvin, and the effect other Protestant reformers had on Europe. A unit on the Age of Discovery, explorers, conquistadors, and the Columbian Exchange. A unit on Absolutism in Europe and the rise of a Constitutional Monarchy in Great Britain. A brief unit on Enlightenment thinkers and the Age of Reason in Europe and America. An overview of the causes, events, and effects of the French Revolution plus the rise and downfall of Napoleon. This unit covers the Congress of Vienna and resulting nationalist revolutions in Europe, Latin America, and the Caribbean. A study of industrialization, major inventions, urbanization, and their effects on the world. This unit looks at European imperialism and responses from around the world, with a special focus on Africa, Asia, and India. A unit on the battles and events of the Great War, plus the Russian Revolution, and the inter-war period in Asia. A thorough overview of the war from the rise of dictatorships through the end of the war and formation of the UN. An overview of the Cold War Era from 1945 through the fall of the Berlin Wall. A brief unit on globalization, conflicts, and terrorism in the modern world. An in-depth overview of the major world religions and philosophies. Why not try out some of our great resources for FREE? 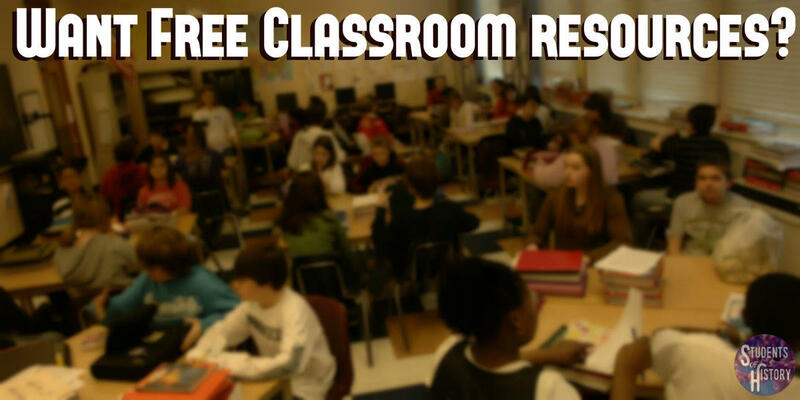 Download our 30-page free sampler pack of social studies resources you can use right away! Download our free sample resource pack! Enter your name and email below to download over 30 pages of free resources you can use right away in your social studies classes!